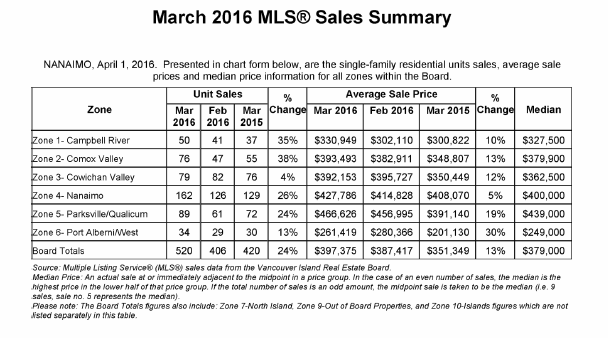 April 4, 2016 NANAIMO, BC – The Vancouver Island real estate market set a brisk pace in March, with buyer demand outpacing supply in most areas. In March 2016, 520 single-family homes sold compared to 420 last March, an increase of 24 per cent. Month over month, sales were up by 29 per cent from the 406 sales processed in February 2016. Last month’s active listings totalled 1,599, down 26 per cent from the 2,167 reported in March 2015. BCREA Economist Brendon Ogmundson states that the robust market conditions occurring throughout the province are reflective of British Columbia’s vibrant economy. The provincial economy is the strongest in Canada, with GDP growth expected to be around three per cent this year. Extremely strong construction activity, surging retail sales, and the highest job growth in three years are key economic drivers fuelling the bustling real estate market. “Although we’ve been saying that the housing market can’t continue at this pace indefinitely, there are no signs that point to a slowdown,” says Ogmundson. Ogmundson notes that although single-family homes are still the most popular property type, changing demographics could shift that trend in the next decade. “Over the next ten years, there will be around 200,000 people between the ages of 20 and 49 in the province, so we expect that demand for townhouses and condominiums will increase,” says Ogmundson. VIREB President Margo Hoffman reports that it has been several years since REALTORS® have been this busy, but low inventory continues to be a major challenge for REALTORS® and home buyers in the VIREB area. Multiple offers, particularly on single-family homes, are common occurrences. Despite rising prices, Hoffman notes that the VIREB housing market is still very affordable compared to Victoria and Lower Mainland communities. Whether you are a buyer or seller, Hoffman also notes that a REALTOR® is a vital partner in the sales process to ensure you price your home appropriately for selling and pay the right price when buying. In March 2016, the benchmark price of a single-family home in the VIREB area was $350,400, up seven per cent from one year ago. Benchmark pricing tracks the value of a typical home in the reported area. The benchmark price of townhouses and apartments also increased in nearly every market. The average MLS® price of a single-family home in March was $397,375, a 13 per cent increase from March 2015. VIREB represents nearly 965 REALTOR® members in approximately 90 member offices on Vancouver Island (north of Victoria).